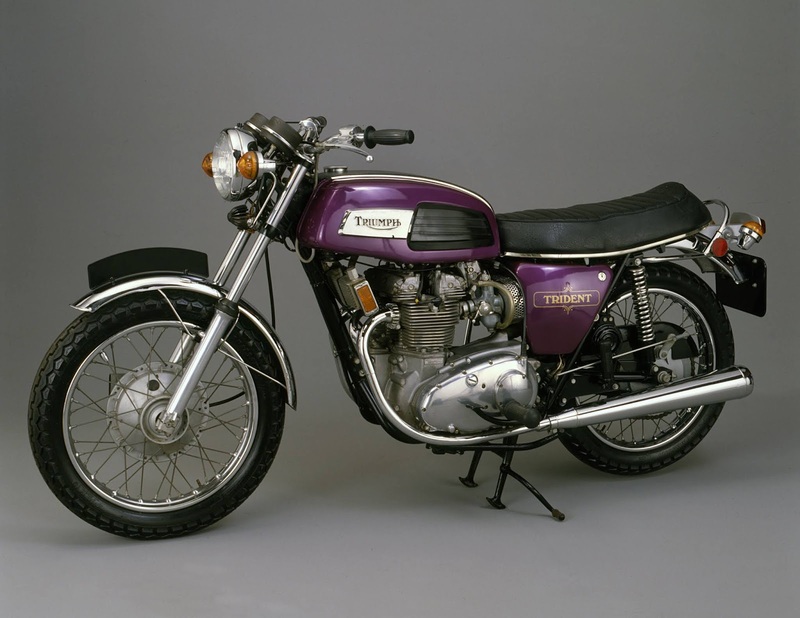 Perhaps, not even its most ardent admirer would profess the Triumph Trident to be the prettiest motorcycle ever made. And - at the time of its 1969 release - there were those who agreed! Especially, in the curve-conscious USA - where the Trident's straight-line styling was not everyone's cup of tea ... or, coffee! True, the Trident's 'ray-gun' silencer was Batman-flash - but that alone was not sufficient to rescue a somewhat staid design. Ergonomically, too, things were relatively conventional - thanks to the upright riding position dictated by high handlebars. Visually, then, it would be fair to say that the Trident did not set the motorcycle world on fire. On the performance chart, though, the Trident's spikes were higher. It made good, if steady progress - to a top speed of 125mph. And the bike had high-quality handling, to match. But, the Trident's timing was not great ... in terms of its release-date, that is! The Honda CB750 was just around the corner - and its four-cylinder engine would usher in a new dawn for motorcycling. At the racetrack, things were better ... much better! Triumph's Trident would be etched into the annals of motorcycle history by the legend that was 'Slippery Sam'. Percy Tait took the Trident-based racer to Production TT 'triumph' - from 1971 through to '75. Stateside, too, the Triumph triples blazed a trail. Not least, on account of their Rob North frames. Gene Romero finished second at Daytona, in 1971 - his Triumph resplendent behind its blue-and-white fairing. So, mixed reviews for Triumph's Trident. While it was cheered to the echo at the citadels of racing, design-conscious road-riders were not always as rapturous. Some may even have thought it a tad dull ... but, that was before they opened up the throttle!